Free hotel shuttle service will be available between Brussels International airport and the hotel. 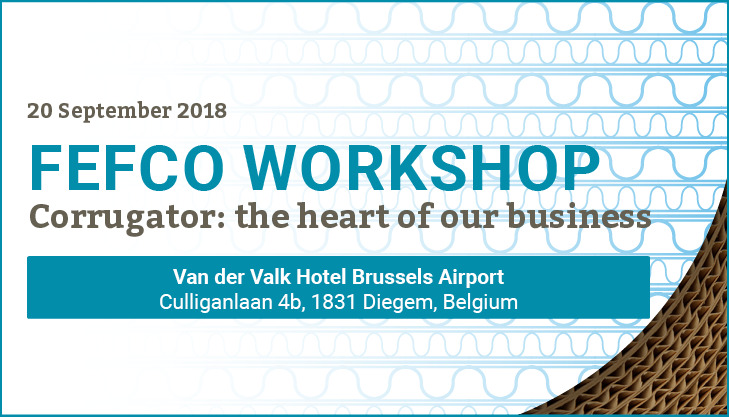 Hotel reservation: Please use the hotel booking form and send it back to banqueting@brussels.valk.com or call +32 2 277 20 21 and refer to "FEFCO Workshop". Deadline for the reservation at FEFCO rate is 10 August 2018. The corrugator is the first essential step in making corrugated boxes and is having a major impact on efficiency, waste reduction and quality throughout the manufacturing process in our corrugating plants. The objective of this event is to develop and exchange good practices to improve corrugator running speed, increase reliability and optimize the process to control and improve efficient corrugator performance. This is a unique opportunity to see new developments and upgrades proposed by the corrugator manufacturers and discuss with your colleagues the future challenges and opportunities. This event will bring you concrete updates on the market trends on the corrugator technology and process. This workshop is for FEFCO members only. Registration fee: 395€ (excl. taxes) per person. Payment is mandatory with a Credit Card (VISA or MasterCard only). If you register more than one person, you can pay with different credit cards. Registrations that are not paid within 5 working days will automatically be cancelled. It will still be possible to register again until one week prior to the event date. Receipts and invoices are available here once the payment is confirmed. Only cancellations requested via the registration platform will be accepted. Replacements are possible until one week prior to the event. Please request replacements via the registration platform.